Welcome to ATSI, Lawrence’s REAL Transmission automotive specialists. ATSI opened for business in 1993 on a back street, unknown to many locals. It started from a figment of the imagination that was fed with pure ethical decisions that allowed it to grow into what it is today. After another seven years buried and embarrassed to be in the back half of a used car lot. ATSI bought and moved to their present location at 1226 E. 23rd Street, with an eight bay shop and for the first time Main street frontage. 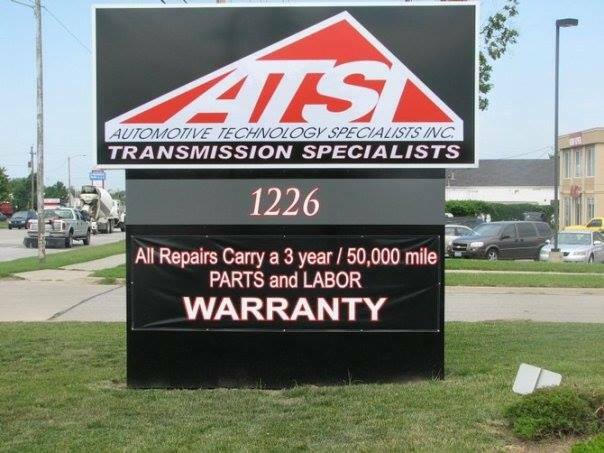 ATSI decided to take their warranty to the next level by making all work and repairs carry the same coverage as their transmission, 3 years 50,000 mile parts and labor warranty with no excuses. With numerous shops in the area claiming to be transmission shops, ATSI offers- Real transmission check outs with preliminary check outs only $47.10! ATSI also can perform a complete courtesy check, so that customers have a detailed assessment of their vehicles condition before they make any decisions on any overhaul or repair. ATSI believes that their savvy clients, given the accurate information, time and all questions answered, are in a position to access their needs and make a decision that is in their best interest with no hassles from a service writer. ATSI has the capability to properly test, repair, rebuild or give the customer an option for an outsourced transmission. Unlike many pretenders, posers or installers, ATSI determines and completes all warranty work. ATSI believes it is unethical to sell a repair, part, service or a transmission without being responsible. ATSI backs its repairs with a 3yr 50,000 mile warranty, and all rebuilds or re-manufactured units come with a 3yr 100,000 mile warranty. Whatever service, repair, or build is done at ATSI, our competent knowledgeable staff is there to handle the job and ensure it is done right. While we do offer transmission correction at a higher level, in reality, we work on cars but we sell accountability. The accountability that the work will be done right, and if a problem arises, we strive to correct the problem and make it right so that you may get back to your day.